Rosa’s start in life is far from auspicious: born only a few days after her father’s brutal murder, her first childhood experience takes place against a sound-track of shells and guns. She moves with her widowed mother Angela, and her uncle Joseph into the Jerusalem neighborhood of Katamon, and immediately becomes known as the most beautiful girl in Jerusalem. Based on a game Rosa played with her three friends one spring day, Rosa’s friends predict that she will marry four different men in the course of her life. To Rosa’s dismay, the prophecy becomes known in the neighborhood and is never forgotten. At the age of 15, Rosa is made pregnant by Joseph, They get married, an action that will cause Rosa throughout the rest of her life to mourn her lost childhood. However Rosa bears seven children and shares a warm, happy marriage with Joseph, full of sensuous love. She lives a peaceful life, in a perfect routine she has set for herself. She sticks to her routine, afraid of change, believing that any changes could only be negative and serve to upset the perfect balance of her life. Changes do occur, however, when Rosa becomes pregnant in her 50s and give birth to Angel, her eighth and most beloved child, a beautiful deformed hunchback. Joseph unable to cope with his child’s abnormality, gives himself over to senility and dies, leaving Rosa to mourn but also to discover Joseph’s secret betrayals of her throughout their marriage. True to her friend’s childhood prophecies, Rosa marries other men, falling deeply in love with all of her husbands, who love her in turn and worship her beauty and her plentiful flesh. Each marriage ushers new dimensions of love as well as new pain into Rosa’s life, as she learns more about herself and the men who adore her. With each marriage, she battles the spirit of her former husbands, treating them at once with both love and anger. Though a childhood prophecy leads her to believe that she will have four husbands, nothing prepares her for the extraordinary and remarkably diverse life she is to lead. 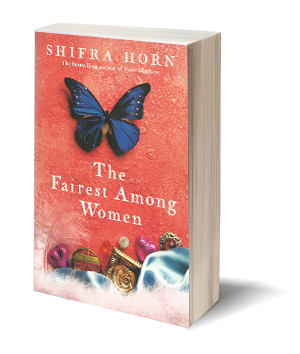 Horn’s second novel is a magical tale about the courage to love and the strength of spirit. The sensuous novel refreshes the reader with its vivid imagery and its rich details. The fairy-tale quality of Horn’s narration captures the imagination of even the most pragmatic realist. Horn’s novel is a tearjerker and is difficult to put down. Its blend of humor and tragedy serves to bring both tears of joy and pain to the reader’s eyes. A wonderful lush novel, reminiscent of the magic realism of Gabriel Gracia Marquez or Isabel Allende but with its own Israeli flavor. The telling is sometimes earthy and explicit, at other times deft and delicately poignant. An interesting novel that is a fascinating and engaging read. Horn has lovingly concocted a zesty novel… spiced with saffron; honey and sesame for dessert, and a varied, graceful accounting of Rosa’s assortment of charms… it isn’t hard to recognize the sites of Jerusalem and the sources of inspiration of the author… the reader is awarded his full satisfaction by the heartwarming depiction of the life of this character. Translated to: English, German, Italian, Dutch and Estonian.